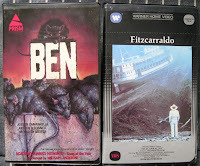 Is Ben even available on DVD anywhere? Oh, and answer my damn question I sent you via PM at HorrorTalk, jackass. This makes four copies of Mosquito Mr. Astro, the Image DVD, two Hemdales, and one Plaza VHS that's sealed. again i pose the question, where the HELL is this swap meet and why do I only walk away with Interview with a Vampire at mine despite my thorough combing? ?